Teo wears Roksanda dress €1,835 and Maria wears Givenchy coat €2,890, pictured on the roof top of Brown Thomas Dublin car park at the launch of Autumn Winter 2018 collections. Photo: Leon Farrell/Photocall Ireland. As Ireland soaked up the glorious sunshine last week, a tenacious Dublin mum-of-two launched her first clothing line and her blue sky thinking was rewarded with just that – blue skies over Dublin Bay. Denise Moroney’s ‘Sophie Sarongs’ is an online luxury business aimed at discerning sun-seekers. Some women get their lightbulb business ideas sitting with coffee at the kitchen table, Denise got hers sitting on the beach, struggling with an unsuccessful quest to find the perfect cover-up that was flattering as well as functional. At a time when fashion production in Ireland is very, very limited, it was uplifting to hear that this new Irish business has the sarongs manufactured here by a talented team of seamstresses. Smaller or larger sizes can be made up as special orders. The fabrics range from very fine viscose to translucent tulle. Denise launched with one style in 16 different prints and colourways. They include lovely painterly touches like ‘Dufy Pomegranate,’ ‘Monet Marble’ and ‘Monet Water Garden’. The sarongs fit sizes 10-14 and have an elasticated bodice and a dipped hemline cut cleverly to hide knees – something I spotted at first sight. The bodice is made from a jersey stretch material, similar to the material used in swimwear (84pc polyester/18pc Lycra) and the handkerchief skirt which falls from under the bust is made from a very fine polyester. The sarongs are machine washable at 30°C. “I wanted something practical but elegant, with a flattering silhouette that I could wear into a beach café/restaurant over my swimsuit and enjoy a long cool drink after a hot day on the beach,” Denise says. 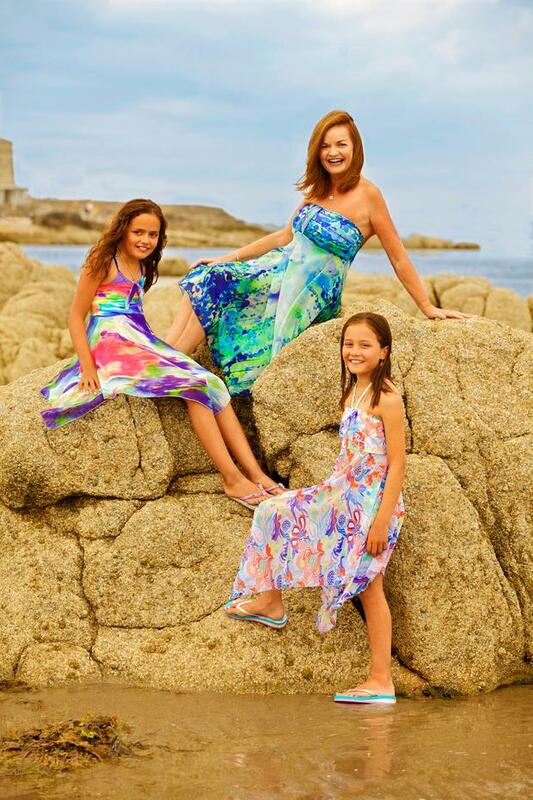 “The business is aimed at an international audience and the sarongs were named after one of my twin daughters, Sophie (11), because she designed and painted our hibiscus logo. In addition to adding new cover-up pieces to our collection, we are also designing Bella Boo bikinis in matching fabrics to the sarongs for next year’s collection, named after my other daughter, Daniella Bella Boo,” said Denise. If ever I saw a dress that played to Meghan Markle’s pared-back aesthetic and love of bare shoulders, it was this Roksanda Ilinic A-line camel wool dress (€1,835) modelled by Teo at the recent Brown Thomas AW18 season launch. The event took place in store the morning the Duke and Duchess of Sussex arrived here, and with her appreciation of modern tailoring, and indeed the Givenchy label, I suspect Meghan might also rock the black and white check Givenchy coat (€2,890) cinched in with a contrasting brown leather belt. Wearing foundation in warm weather can be tricky and sometimes a tinted moisturiser just isn’t enough. My saving grace has been discovering the Catrice Light Correcting Serum Primer, €4.95, available in Penneys, Dunnes Stores and pharmacies nationwide, which gives a lovely smooth finish so your make-up doesn’t slide off or stick in your pores. Karen Birney, THEVOW.ie Before we start, we should mention that this one’s not for the wallflower bride. Darren Kennedy: What’s up, buttercup? Meadhbh McGrath When we look back on what we wore in the 2010s, the midi will likely stand out as the defining silhouette of the era. Of course, the hemline that returned to the catwalks in 2013 was nothing new – the mid-calf style stretches back as far as the late 1920s, and was an essential component of the 60s woman’s wardrobe.